December 1917 brought, amidst the gloom of repeated setbacks on the battlefields of the Western Front, welcome news to the British government in London. Having tasked Sir Edmund Allenby with leading British forces to success in capturing the holy city of Jerusalem by Christmas, David Lloyd George received news of its fall on 9 December. The loss of Jerusalem constituted a grave setback to Ottoman prestige in the region. 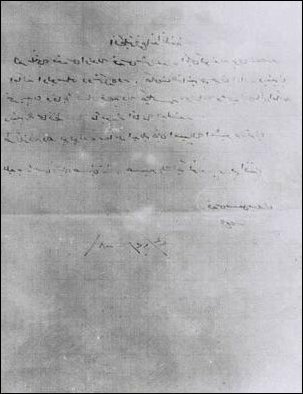 Reproduced below is the text of the decree of surrender issued by Izzat to the British. Click here to view a larger image of the document.